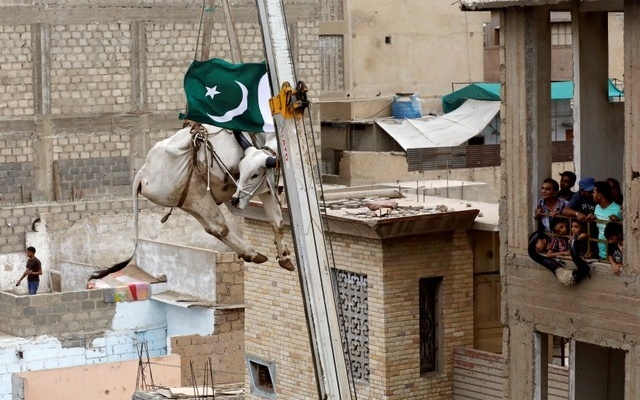 Reuters: Residents of Karachi, Pakistan’s largest city, watched as cattle were lowered by crane from the top of a four-storey home ahead of the Muslim festival Eid al-Adha. Ahmad started raising calves in a rooftop shed about 15 years ago. As they grew in size, it became difficult to lead oxen down the narrow staircase of his house.His solution? Call a crane service. The operation has become an annual event in Ahmad’s neighbourhood of Nazimabad, where a crowd cheered as it watched the spectacle unfold.